Connected cars are an increasingly common sight on our roads. The term actually spans a range of technology, including playing music on your smartphone through the radio via Bluetooth, using a 4G internet connection to download software updates for the car automatically, alerting the emergency services in the event of a crash, and providing real-time updates on congestion and accidents along your route, among other features. Manufacturers are always looking for new ways to use technology to benefit the driver and improve the services provided. They are, of course, a selling point for most new vehicles but connected cars also provide valuable feedback to manufacturers and retailers. Being able to monitor wear and tear on their vehicles can help them predict which parts will be most in demand – and make improvements in the future. It also gives them an opportunity to contact the customer to let them know a repair or replacement will be needed soon, order the exact part required on their behalf and offer them a list of locations for where to get the work carried out. Are all new cars connected? Not quite. But according to data compiled by Car Care Plan from the Department for Transport and best-selling-cars.com, it was predicted that 100% of new vehicles sold by 11 of the top 30 manufacturers were connected in 2018, with almost all others not far behind. 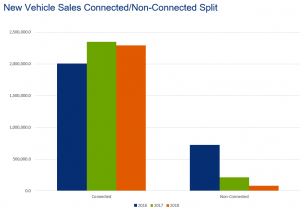 Overall, the number of new connected vehicles sold far outweighs the number of new non-connected vehicles. Connected cars currently fall under two main brackets: “single vehicle applications” and “cooperative safety-of-life and efficiency”. The former includes features such as smartphone integration, roadside assistance, parking apps, remote diagnostics and voice commands. While the latter is about vehicle-to-vehicle communication and communicating with the road infrastructure to provide a safer and more efficient journey for the vehicle’s occupants. This wider communication network is where a lot of futuristic advances will be made. There have been suggestions that vehicles will be able to automatically plan routes around roadworks, dodge crashes by being aware of other vehicles, and even sync with the traffic light system to provide a smooth journey. By connecting with the “internet of things”, you may be able continue playing a song in your car that you were listening to in the house at the exact point you left, turn the heating on at home ahead of your arrival after leaving the office and order your groceries from the supermarket ready for you to pick up on the way home. There is a myriad of advances that are set to revolutionise how we use our cars. In our next blog, we will look at how car retailers can better support customers who drive connected cars, helping to boost loyalty and retention rates.